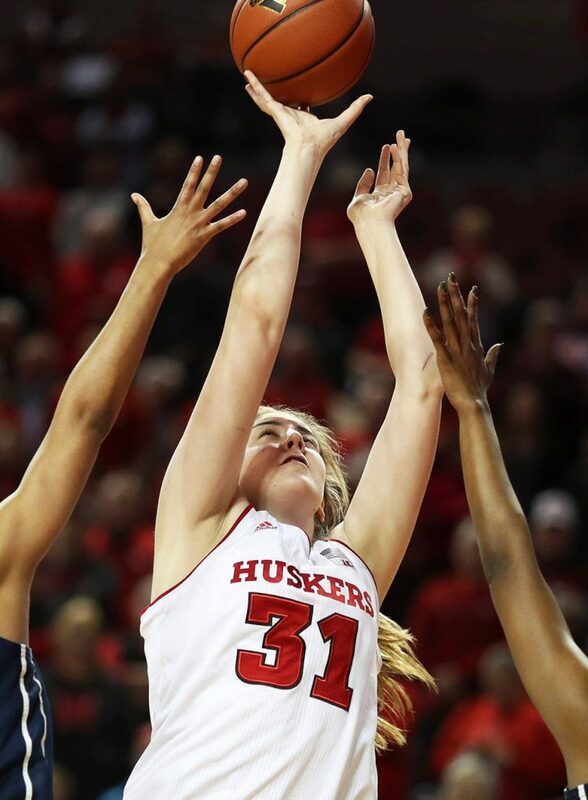 Kate Cain produced one of the best rebounding efforts in school history while producing her fifth double-double of the season to power Nebraska to a 59-51 women’s basketball win over Penn State on Thursday night at Pinnacle Bank Arena. With the victory, Nebraska secured its 17th all-time 20-win season, improving to 20-8 overall and 11-4 in the Big Ten. Penn State slipped to 15-13 overall and 6-9 in the conference. The Huskers moved into a tie for second place in the Big Ten trailing only No. 14 Ohio State, which clinched a share of the conference title with its win on Wednesday night. The Huskers will face No. 13 Maryland in College Park on Sunday, entering the game tied with the Terps for second place in the league standings. Nebraska has secured a top-four seed and a double-bye at next week’s Big Ten Tournament in Indianapolis. An Ohio State loss at Penn State on Sunday, and a Nebraska win at Maryland would give the Huskers a share of the Big Ten regular-season title along with the Buckeyes, who would secure the No. 1 seed in the Big Ten Tournament with their own win over Penn State Sunday. Both games will tip at 11 a.m. (CT) on Sunday, with the Husker game at Maryland on the Big Ten Network and the Ohio State/Penn State game on ESPN2. Cain, a 6-5 freshman center, set the tone inside for the Big Red against the Lady Lions, pulling down 20 rebounds to tie for the sixth-most boards by an individual in school history. She added 14 points on 6-of-8 shooting, while adding three blocks to give her 90 blocked shots on the season and move her into Nebraska’s career top 10. With Cain leading the way on the glass, Nebraska produced a whopping plus-29 edge on the boards, 60-31, for the Big Red’s largest rebound margin of the season, which ranked as the ninth-best rebound margin in Husker history. Cain was far from alone on the glass inside. Point guard Hannah Whitish added nine points, eight rebounds and five assists, while freshman Taylor Kissinger pitched in eight points and seven boards. Senior Jasmine Cincore contributed three points at the line while adding seven points of her own. Junior forward Maddie Simon also gave the Big Red a huge lift by scoring a game-high 16 points to go along with six rebounds and a steal. Simon and Cain were the only Huskers to manage double figures in a low-scoring affair, as they combined to go 11-for-20 from the field. The rest of the Huskers were just 8-for-40. Nebraska’s defense and rebounding keyed the victory, as the Huskers held Penn State to just 28.1 percent (18-64) shooting, including just 19 percent (4-21) from three-point range. The Huskers also limited the Lady Lions to just 11 points at the free throw line. The Huskers hit just 31.7 percent (19-60) of their shots, including just 2-of-20 threes, but Nebraska secured the win by connecting on 19-of-25 free throws. Nebraska’s field goal percentage and three-point field goal percentages were both season lows. The Huskers also dished out a season-low eight assists while committing 17 turnovers against an aggressive Penn State man-to-man defense. The Huskers took a 32-24 halftime lead behind strong halves inside from Cain and Simon. Cain hit all three of her shots from the field and both of her free throws to score eight points while yanking down nine first-half rebounds. Simon added a huge second quarter with seven points to finish with a team-high nine in the in the half, while adding three rebounds. The Huskers built an eight-point lead at the half by dominating the glass, 31-20, including nine offensive rebounds. However, the Lady Lions won the first-half turnover battle 7-4. Nebraska hit just 10-of-30 (.333) shots from the floor, including just 2-of-13 threes, but the Big Red hit 10-of-12 first-half free throws. The Huskers held Penn State to just 20 percent (7-35) shooting in the half, including 3-of-13 (.231) threes. PSU also hit 7-of-9 free throws. Guards Kamaria McDaniel (9) and Amari Carter (7) led the Lady Lions in scoring, while the Huskers held Teniya Page scoreless on 0-of-10 shooting. Nebraska held Penn State without a field goal in the final 5:45 of the half, outscoring the Lady Lions 10-5 to build its biggest lead of the half at 32-24 on two free throws from Jasmine Cincore with 11.6 seconds left. For the game, Carter led Penn State with 14 points, while reserves Siyeh Frazier (11) and McDaniel (10) also managed double figures. Page scored all 10 of her points in the second half, but was held more than eight points below her season scoring average. The Big Red also shut out sophomore guard Jaida Travascio-Green, who entered the game as PSU’s second-leading scorer behind Page. That duo entered the game averaging 30 points per contest. Kate Cain had 14 points and 20 rebounds.